copyright 1997 by the Foundation for A Course in Miracles. 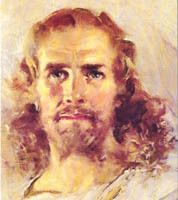 Following from our discussion in the previous section, we can see that all Jesus asks of us is that we be aware of exactly what we are doing, and the true cost of our mistaken decision: namely, by choosing the ego over him, we are willing to forego the knowledge of Who we are as Christ and the memory of the Love of our Source. And so Jesus' constant question to us: "Is this measly crumb of specialness what you really want, 0 holy Son of God, when I offer you instead the fullness of love's banquet?" It is a question he continually puts to us in A Course in Miracles, as seen in the following examples. You do not ask too much of life, but far too little. When you let your mind be drawn to bodily concerns, to things you buy, to eminence as valued by the world, you ask for sorrow, not for happiness. This course does not attempt to take from you the little that you have. It does not try to substitute utopian ideas for satisfactions which the world contains. There are no satisfactions in the world (W-pI.133.2; italics mine). What is the Will of God? He wills His Son have everything. And this He guaranteed when He created him as everything. It is impossible that anything be lost, if what you have is what you are .... Here [in this world] does the Son of God ask not too much, but far too little. He would sacrifice his own identity with everything, to find a little treasure of his own. And this he cannot do without a sense of isolation, loss and loneliness. This is the treasure he has sought to find. And he could only be afraid of it. Is fear a treasure? Can uncertainty be what you want? Or is it a mistake about your will, and what you really are? ... God's Son could never be content with less than full salvation and escape from guilt. For otherwise he still demands that he must make some sacrifice, and thus denies that everything is his, unlimited by loss of any kind .... If loss in any form is possible, then is God's Son made incomplete and not himself. Nor will he know himself, nor recognize his will, He has forsworn his Father and himself, and made Them both his enemies in hate. A miracle can make no change at all. But it can make what always has been true be recognized by those who know it not; and by this little gift of truth but let to be itself, the Son of God allowed to be himself, and all creation freed to call upon the Name of God as one (T-26.VII.11:1-4, 7-14; 14:4-5,7-9; 20:4-5; italics mine in 11:7-10). an echo of the reply of His Voice. The real sound is always a song of thanksgiving and of Love. You cannot, then, ask for the echo. It is the song that is the gift. Along with it come the overtones, the harmonics, the echoes, but these are secondary. In true prayer you hear only the song. All the rest is merely added. You have sought first the Kingdom of Heaven, and all else has indeed been given you (S-1.1.2:8-3:6). One of the loveliest expressions of Jesus presenting us with the choice between our insane and meager gifts or his glorious ones comes in "The Gifts of God," the prose poem Helen took down in 1978. It began as a special message to her from Jesus during a time of great anxiety, in which he pleaded with her to accept his gifts of love in place of her ego's gifts of fear. The full story of the scribing of this message can be found in Absence from Felicity: The Story of Helen Schucman and Her Scribing of A COURSE IN MIRACLES, pp. 419-22, but as will be seen from this passage, it is a wonderfully comforting message for all students of A Course in Miracles. It points to the tremendous cost we are willing to pay to be right, remaining as an individualized and special self, and our great happiness when we finally and gratefully realize we have been wrong. So fear was made, and with it came the need for gifts to lend the substance to a dream in which there is no substance. Now the dream seems to have value, for its offerings appear as hope and strength and even love, if only for an instant. They content the frightened dreamer for a little while, and let him not remember the first dream which gifts of fear but offer him again. 0 children of the Father you forgot, you have not put your idols in His place nor made Him give the gifts of fear you made. Let me be Savior from illusions. Truth may be concealed from you by evil dreams, but it is only from the dream that you have need from saving. Truth is still untouched by your deceptions. Yet you cannot go past that first dream without a Savior's hand in yours. Each gift of fear would hold you back unless you let me lift it from your mind by showing you that it is but a dream within a larger dream of hopelessness in which there is no hope. Take not its gifts, for they condemn you to a lasting hell which will endure when all the seeming joy the gifts appeared to give have passed away.... Help me give you salvation. Let us share the strength of Christ and look upon the dream in which illusions started, and which serve to keep their birthplace secret and apart from the illumination of the truth. Come unto me.... Salvation needs your help as well as mine. Do not forget you do not answer for yourself alone. My call to you is that you offer help from all the dreams the holy Son of God imagines, from the time that first of dreams was given false reality until all dreaming ends forever. Could a gift be holier than this? And could the need within a world of dreams be more acute or more compelling? Give me help in this, and not one gift the world may seek to give, nor one illusion held against the truth, can bind you longer (The Gifts of God, pp. 120-21). Deny me not the little gift I ask, when in exchange I lay before your feet the peace of God, and power to bring this peace to everyone who wanders in the world uncertain, lonely, and in constant fear (T-31.VIII.7: 1).